Our division strives to provide the highest level medical care in a veteran-centric manner. Cardiologist Dr. Kendrick Shunk and Cardiac Surgeon Dr. Elaine Tseng speak with a veteran after successful TAVR surgery. The San Francisco VA Cardiology Division strives to provide the highest level medical care in a veteran-centric manner. Our faculty include world-renowned experts, who have chosen to focus their clinical care to veterans. After taking an extended East coast detour, we are delighted that Dr. Laura Flink landed back from whence she came—the San Francisco Bay Area. Laura joined the SFVA cardiology staff in September of 2016 and currently attends in echocardiography, general cardiology and CHF clinics. Laura brings many unique aspects to the division, including compelling research in women’s cardiovascular health. She currently partners with the Women Veteran Cohort Study to examine the risk of cardiovascular disease in women with polycystic ovarian syndrome and is working on a study of diastolic dysfunction in women with hyperandrogen states using an NIH/NHLBI database. She became interested in this area as a result of research during residency about disparities in cardiovascular health in women. Laura grew up in Berkeley, California, and spent time in Providence, RI, for her undergraduate degree (Brown). After completing medical school at UCSF in 2009, she returned East for internal medicine residency at Columbia followed by cardiology fellowship at NYU. 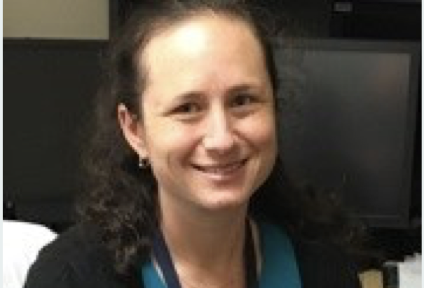 Among the many reasons she cites for accepting a faculty position at the SFVA is a desire to be back in the Bay area—near her parents and her sister who was a GI fellow at UCSF and now GI faculty (Dr. Sara Lewin). She also notes the collegiality of her cardiology colleagues (many of whom she knew as a student at UCSF), the unique blend of academic and community settings and the patient population. When a trainee at UCSF, Laura developed a deep connection to the UC system and educational mission. She now enjoys giving back in the form of teaching trainees on all levels…students, residents and fellows. While it would seem there is little time for much else at the end of her workday, Laura also manages to gracefully raise two small people (Eli, almost 1 and Emma, age 3). Not a job for the faint of heart, another important person helps her with this, her husband, David. He also runs a national nonprofit for children with learning disabilities called Eye to Eye. During ‘down time’ the power-duo enjoy hiking with kids in tow and occasionally Laura escapes to do spinning cycling. 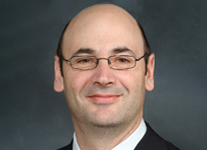 We are thrilled to announce that Jorge R. Kizer, MD, MSc has joined as new Chief of the Division of Cardiology for the San Francisco VA Health Care System and Professor of Medicine in the UCSF Department of Medicine. He has a secondary appointment in our Department of Epidemiology and Biostatistics.